South Bank is a residential resort & marina community along 2,200 ft of beach & iron shore including a unique peninsula located on the southwestern end of Long Bay beach, offering some of the finest views over the Caicos Banks. Southbank is the newest collaboration of Windward Development Ltd. & architect Blee Halligan, following on the success of recently sold out Blue Cay in Leeward. Management & services will be provided by Grace Bay Resorts, renowned operators of the iconic Grace Bay Club & their Private Residences Collection. An optional rental management program will be available to all home owners. Anchored by a full-service Marina, South Bank is comprised of 31 managed acres of low-density residential development, each neighbourhood is architecturally diverse yet united in a “livable contemporary” aesthetic & emphasis on ease of access to the water for boating, maintaining all the while, the relaxed sophistication Windward Development has become known for. Additional options available to personalize your home. This inclusive resort community is offering two waterfront locations in its first phase: The Ocean Estate I, comprised of 8 oceanfront homes & The Lagoon I ranging in price from $1,750,000 to $2,100,000, & 7 beachfront homes set on a peaceful lagoon fed by the ocean ranging in price from $3,950,000 to $7,950,000. At full build out, amenities will include Marina, fitness center & spa, tennis court, clubhouse with pool, bar & restaurant, café, lagoon peninsula with lounging cabanas, non-motorized water sports, beach club & Long Bay beach access. Living or staying at Southbank is crafted to be effortless, a respite, where owners can relax knowing the details are taken care of. With 130’ of ocean frontage & partial beach frontage over nearly an acre Bluff House is the signature South Bank villa. 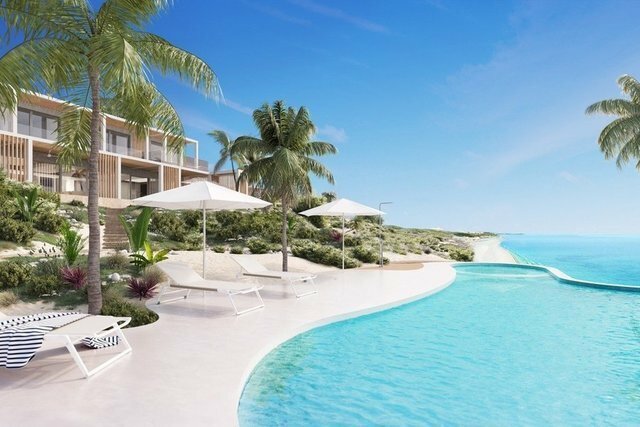 Perched above a dramatic, elevated point with direct access to Long Bay beach, lot 3 is amongst the finest sites available in the Turks & Caicos. The 82’ wide home spans 7,683 covered SF (13,570 total) maximizing ocean frontage & unencumbered ocean views. The ultimate in open & contemporary Caribbean living. The main level living, dining & kitchen area is 57’ wide, allowing complete flexibility in use & fantastic space for entertaining, openly connected to the front & ocean side decks, allowing space for outdoor use throughout all parts of the day. A 62’ wide L-shaped pool sits off of the main living area & main level master suite. The upper level provides 2 spacious oceanfront master bedroom suites & 2 guest bedrooms, all with private terraces. The primary master suites on each level occupy corner positions & benefit from add. Perquisites, enlarged ensuite bathrooms, outdoor showers & oversized soaking tubs. An organic beachside pool surrounded by lounging decks provides truly unique vistas across the entire breadth of Long Bay beach. A hot tub & shower complete the unique beach experience. Amenities include a preparation kitchen, multifunctional room for gym, office, staff quarters or similar, owner's storage and two car garage.